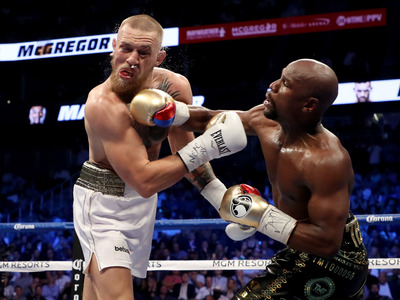 Getty ImagesFloyd Mayweather beat UFC fighter Conor McGregor in a boxing fight. Floyd Mayweather says he’s not going to fight in UFC after all. Mayweather claimed last week that he could make a billion dollars from a three-fight UFC deal. UFC president Dana White confirmed the news just days later. Don’t expect Floyd Mayweather to step into a UFC cage anytime soon. But Mayweather – who retired unbeaten after 50 professional bouts in boxing – has now claimed that it’s not going to happen. “Exactly what I said is this – if I made over a billion dollars before, I could do it again,” he said on a phone call to Fight Hype. “If I chose to get in the UFC and fight three fights or four fights and then fight Conor McGregor, I could make a billion dollars, which I can we just don’t know what the future holds for Floyd Mayweather.